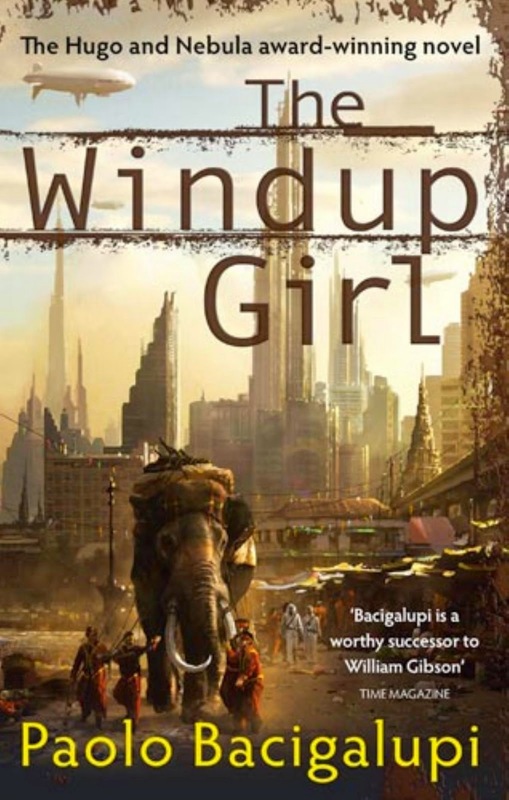 It’s hard to believe while reading it, but The Windup Girl is Bacigalupi’s debut novel. It’s so incredibly vivid yet strikingly topical that you’d think the guy had been churning out long-form stories for years (most of his formative work came in the way of award-winning short stories). Others had the same reaction as Bacigalupi’s The Windup Girl was awarded the Hugo, Nebula, Compton Crook and Locus awards. Now that we know the setting, let’s take a look at the players. The major forces in The Windup Girl are the child queen’s regent, the chief of the Environment Ministry and the chief of the Trade Ministry. Each of them have their own agendas and their decisions ultimately decide the fate of Bangkok. They’re also manipulated in turn by the book’s more active characters: Anderson Lake, an economic hitman for AgriGen who is in Thailand under the pretense of running a kink-spring factory that’s developing a revolutionary type of spring, but is actually searching for Thailand’s incredibly lucrative seedbank; Hock Seng, Lake’s Chinese manager of the company, an embezzler and opportunist who is trying to reclaim his former fortune; Jaidee Rojjanasukchai, the “Tiger of Bangkok” and upright captain of the Environment Ministry’s armed enforcement wing; and finally Emiko, the girl for whom the book is titled, a humanoid GM organism used as a slave, genetically programmed to seek and obey a master. The plot expertly weaves the stories of these characters and more throughout a tale of espionage, corruption, rebellion, corporate greed and much, much more. –Taken from, http://collider.com/paolo-bacigalupi-the-windup-girl-movie-adaptation/ . Read the full article on why he thinks it’ll make a good movie. I sort of agree with him. A concept art showing Emiko taking a dive to escape her hunters that I found online by Sharksden. What I Thought About It. Ok so the above should fill you in on the basics of the book. The main stuff. I know it’s a bit of long read but I think Mr. Trumbore from Collider.com did a better job than i ever could. Me not that good at summaries. Anyway i read this book about a month ago. I know it’s been out there since 2010 but hey, you get to somethings when the opportunity presents itself. First off i don’t think I’ve read that many sci-fi stuff. Not that I’m not a fan but it’s just not something i pick up automatically. I picked up this book because the cover looked good, the synopsis sounded interesting and it’s an award winning book. So i figured why not? Anyway i bought it last year at the Big Bad Wolf Book Sale so it was a steal. For those of you who are reading this but are not from Kuala Lumpur or Malaysia, it’s an annual book fair that happens in and around Malaysia. The one that happens in KL takes place in this huge building that’s about the size of two soccer fields and it’s just a big empty space. This big empty space is then filled with tables, the tables are then piled high with books. The books aren’t of the latest variety but if you look hard enough you might find some. The prices range from RM5 to a few hundred depending on the type. Fiction and Sci-fi usually costs around RM8 which is a little over 1 British Pound or a little over $2 US. So it’s dirt cheap. I don’t know how they do it but I’m glad they do. So once a year i go on a book buying spree to stock up on a years worth of reading. Back to the book in question, The Windup Girl by Paolo Bacigalupi. I found it to be a fascinating read. The world of the Windup Girl seems distant but very familiar. The sights and sounds aren’t that hard to imagine so it becomes very real. And the situation that the planet is in seems very possible when you think of what’s happening in the world today. It doesn’t seem entirely far-fetched. Another thing i found most interesting about this book are the characters. For the most part yes. Anderson Lake is the main protagonist but he’s not a hero character not in the traditional sense of it. Not in any actually. Every character here has a very real dark side. A selfish and calculative side. Everyone’s looking to profit for themselves. The only one that has more a good side than a bad side is probably the Tiger of Bangkok, Jaidee. And because of that it makes the story grimmer. Darker. This is a future where utopia is far from a reality. But it’s a pretty amazing one. The streets of this other-worldly Bangkok is rich with life, Even engineered life. Creatures that were made to suit our wants and needs are now running wild in the streets of Bangkok and swimming in the seas, rivers and canals. It makes you think of what science is currently doing with animal research right now and what they might do sometime in the future when money, power and our wanton needs become even more decisive than it is now. What’s even closer to our reality right now is the Calorie Companies. Big multinationals that deal in the production of engineered food and crops. They are in this book far more powerful and influential than nation states and governments. They control the production of food worldwide and military power to back their efforts. It’s like if Monsanto went crazy. A better view of the cover art for the book. It’s both recognizable yet not. The other thing that struck me was how close the story is to where I am. Bangkok isn’t that far away from Kuala Lumpur. To read of how Bangkok still only exists because of a wall and levees and pumps to hold the rising ocean at bay means that peninsular Malaysia may not exist at all. In fact through Hock Seng you learn a little of what Malaysia went through. Hock Seng is a member of the yellowcard community in Bangkok. They are refugees. Fleeing what in this world is called Malaya. The yellowcards are all chinese. They escaped because they were being prosecuted and brutally by the Malay community who much like the Germans during World War 2 demonized the Chinese because they seemingly owned and controlled more wealth in Malaya. This combined with religion made it even worse for the Chinese community. So they fled. In Malaysia of late the seeds of something similar has been planted. Race relations in Malaysia is at risk and it’s the powers that be which is primarily Malay and muslim that although can’t be said are pushing or promoting it they certainly don’t seem to be making obvious efforts to stop it. And that makes this book that much more scary. And what’s even more amazing is that this was publishedin 2010 which means it was written much earlier than that and Malaysia was a much different place back then. To read this version of a future in a book written that long ago that now seems to reflect in a minor way what is happening currently in Malaysia was eerie. The other thing I found intriguing was Emiko. 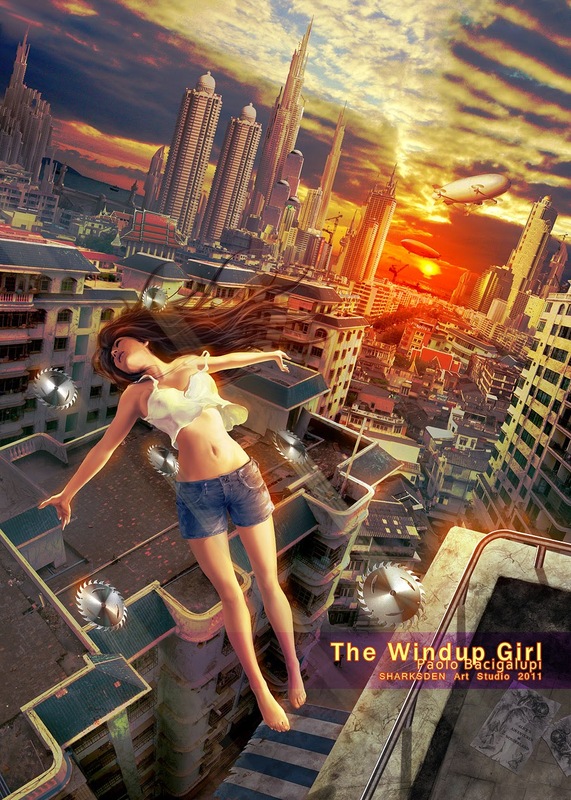 The Windup Girl. A human being genetically created to suit the needs of the Japanese. Japan in this dystopian future faces in exaggerated terms what it is beginning to experience now. The future Japan is populated by more and more of the older generation. The Japanese of this future are living longer but they’re not having bigger families. The work force is dwindling and to fix that they begin to create fake humans. Humans designed to work, to fill the needs of the Japanese. Although Emiko is designed as an assistant as well as to please the wants and ‘needs’ of Japanese men and trained and ingrained to do so, you find out as you read that she is as human as any of us. It’s only her physical traits that makes her different. And she wants to escape what she was meant to be, to find her freedom. What’s more human than that? So as this book progresses you find out what Anderson is looking for in Bangkok. A search for the next product that his company can make or a means to get their hands on Bangkok. You see Hock Seng as he sneaks and connives in order to establish his wealth, influence and power that he had back in Malaya. You go through the anxiety and mental battle that Emiko goes through as she questions her existence, the reason she was made and how to escape it when she learns of a commune filled with people like her. And you see the political maneuverings of those that influence the daily lives of people in Bangkok. Of attempts by one ministry to take over control of another in order to ultimately rule Bangkok by proxy. 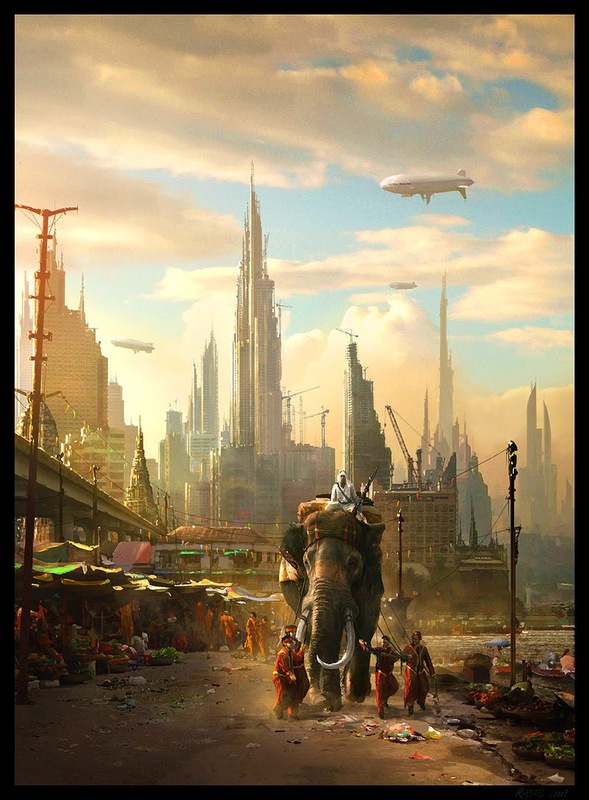 To see street by street what a future Bangkok might look like with it’s bio-engineered plants and animals created sometimes to satisfy a whim and others to fill a necessary need all while holding back the rising seas is amazing. So to conclude, if you didn’t notice it the first time I said it, I like this book. It was a good read. And if you clicked on the link to go to page where i sourced Mr Trumbore’s article I agree with him in that it would make an interesting movie to watch. Maybe even a short series. The world that Paolo Bacigalupi has created is although located in Bangkok is immense. There’s a lot to see and take in in this world. And if you’re looking to escape ours for a while I think this isn’s a bad choice.